The folks at MyVegas have finally found a way to create Apps for IOS (Apple) and Android Mobile Devices that allow us to take MyVegas on the road !!! But, when you link the App to your Facebook account… (which you HAVE to do, to redeem Loyalty Points) …your LP total will update, and track them all together. 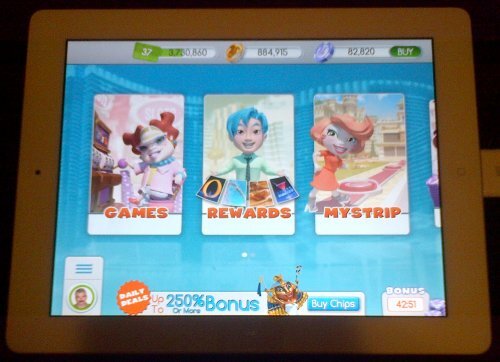 GAMES – takes you to the Slot Games. REWARDS – takes you to the Rewards menu, to review what rewards are offered. 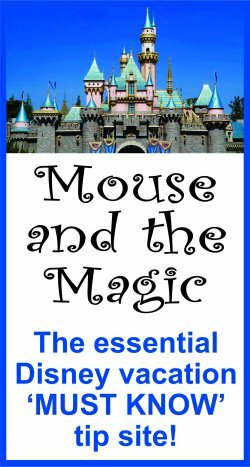 You can sort them by MGM Resort Partners, by Loyalty Point Price, by Categories or by those Rewards that are being Featured. MY STRIP – takes you to your MyVegas Strip map. 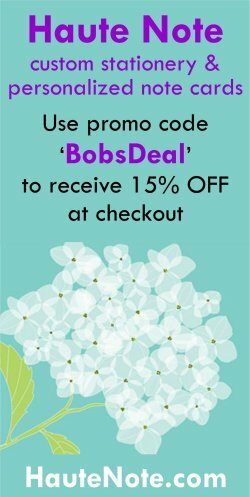 STORE – takes you to the MyVegas Store, where you can purchase Chips. WALLET – shows you any Rewards you have redeemed. The picture is your Facebook picture… (which shows up once you link your FB account, which you should do in order to save any progress) …and shows your overall Challenge progress, and highest Challenge accomplished. The HOUSE icon takes you to the HOME screen. 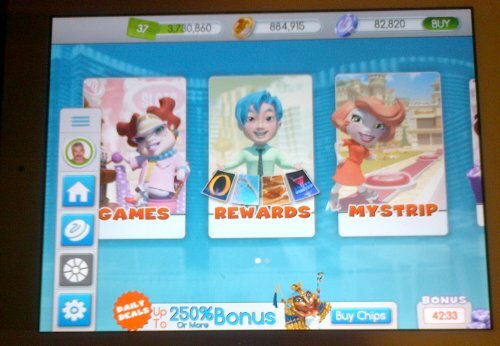 The Blue ‘V’ MyVegas Chip icon takes you to the REWARDS menu. The GEAR icon opens a SETTINGS menu, where you control MUSIC, SOUND EFFECTS and VIBRATION options. This is also where you can LOG IN and OUT of Facebook (if different users are playing from the same mobile device) and where you can get MyVegas HELP. 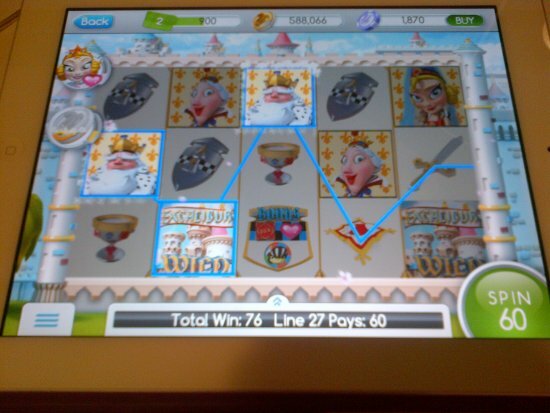 The first few Levels of the Mobile App are played in the Excalibur Slot Game. Once you advance to Level 6, you unlock the Mobile App Strip. Once the Strip is accessed, there is a pathway, (see image below,) with a number of challenge locations. Each location has three different tasks, denoted by Bronze, Silver and Gold Stars. On the strip, you will also see your Facebook friends you have connected with (on the Facebook version of the game) … although you can’t interact with them on the Mobile App. An important consideration is to look over ALL the Challenges available to you, as you start them. 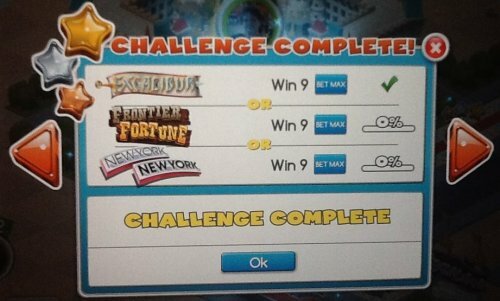 The reason for this is that SOME of the Challenges require you to play MAX BET (the largest wager available to you) and, of course, as you progress further, the amount you can ‘bet per line’ increases… so if you can get SOME of the BET MAX Challenges out of the way earlier, you may save yourself some Chips. It goes without saying, that with collecting Chips being its own challenge, that managing the amount bet is very important. Different Slot Games have different minimum wagers, ranging from 60 Chips (Excalibur, New York New York & Mirage) to 150 Chips (Frontier Fortune, Luxor & Monster Maniacs) to 300 Chips (Pirate’s Cove). 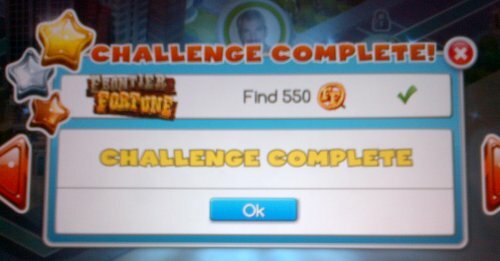 When you complete all three tasks at each challenge location, you see a “CHALLENGE COMPLETED” sign, and can move onto the next challenge you choose. 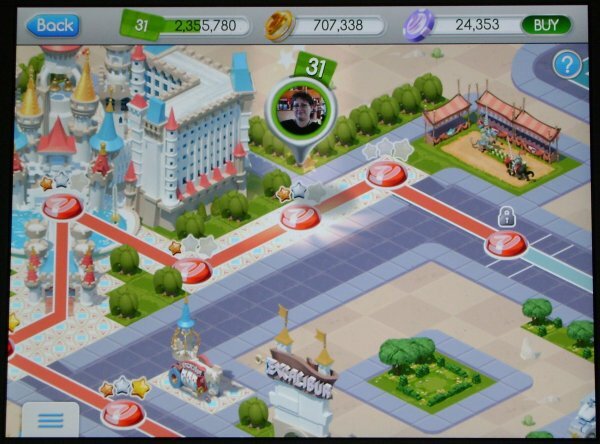 When you are looking at the Strip map, you can tell your progress without clicking on the Challenges themselves, by seeing how many of the Stars are filled in, with Bronze, Silver and Gold Stars. It should also be noted, that the Challenges do not have to be done in order. Although you do have to progress through the Bronze task, to get to Silver… and Silver to get to Gold task. 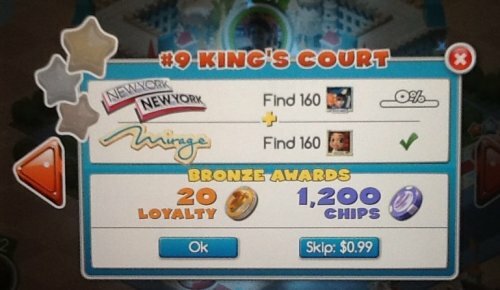 Tasks range from having a certain number of icons appear, collecting a certain number of Purple Chips, Loyalty Points or Chip wins. 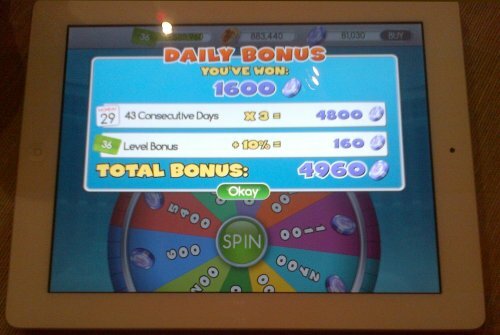 Sometimes the task may require a certain number of consecutive jackpot wins. There are a lot of different tasks, and you can track your progress in the current task, by clicking on the stars on the top, right corner of the screen. (Marked with the red arrow, in the below image.) When you click on the stars, it opens a pop-up screen which shows the task completion percentage on that particular Challenge. 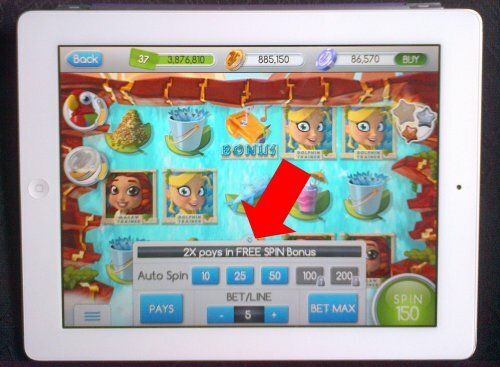 To see the winning combinations for any of the Slot Games, the PAYS table is available to give further information about what constitutes a winning combination of icons, and how to play the Bonus Games. As you progress through the MyVegas App, just like the Facebook version,you get access to an AUTO SPIN option, which allows you to spin multiple times automatically. 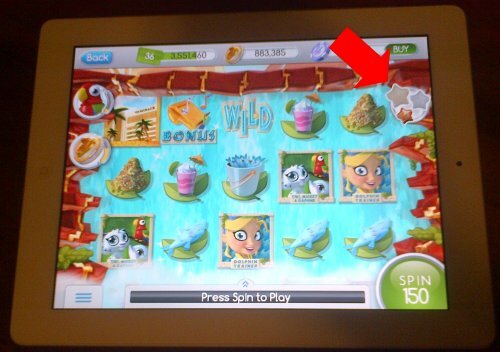 The folks at MyVegas seem to be constantly “tweaking” and tinkering with the App. 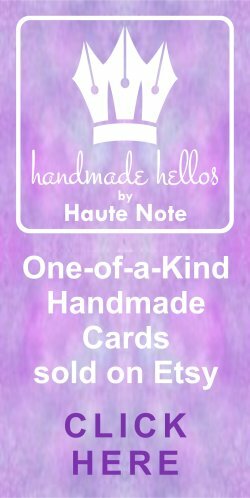 While I have been writing this, they have issued two updates. I’m sure they will continue to work to improve and make it better. In the meantime, whether you prefer the original Facebook version, or the new Mobile App… play on… and Good Luck !